What Is a Powerful Yoga Exercise for Vaginal Strength? The throat chakra, or Vishuddha chakra, is the fifth of these seven energy centers said to whirl around in your body. They influence you physically and emotionally, with the throat being intrinsic to your ability to communicate with yourself and the outside world. Deficiencies in the throat chakra can make it hard for you to speak your truth. With a blocked throat chakra, you may have trouble public speaking or saying "no" when you've got too much on your plate. Anything surrounding your voice is said to depend on the health of this chakra — so even that case of laryngitis might reveal deficiencies. 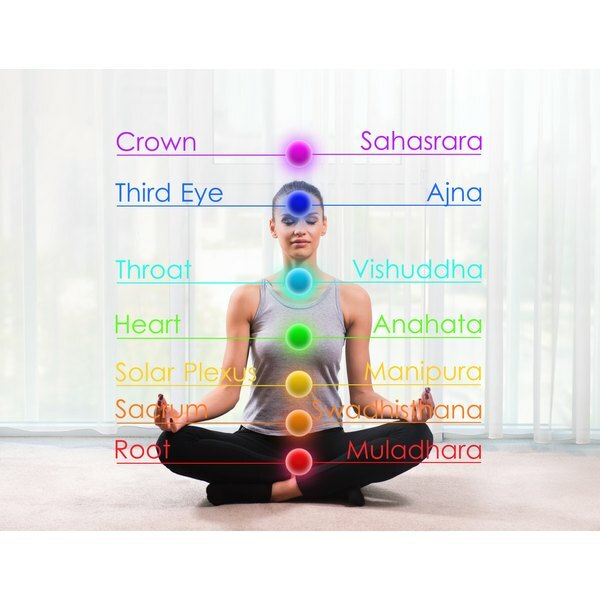 This chakra also influences your thyroid gland and neck or shoulder pain, as well as issues of the jaw or ears. A number of different yoga poses help you balance the throat chakra so that you feel you can better communicate your creativity and ask for what you need. Outside of yoga, adopt fifth-chakra stimulating strategies, such as humming in the shower, reading aloud or surrounding yourself in the color blue. Sit with crossed legs and hands on your knees. Open your chest and throat to the ceiling as you inhale. Exhale, dip your chin to your chest and arch your back like a letter C.
Alternate between the two for five to ten rounds of breath. Camel pose presents a dramatic arch in your back. Not everyone has the hip and back flexibility to touch their heels — so keep your hands on your back if it's more comfortable. Sit on your shins. Raise your buttocks off the floor so you are standing on your knees. Place your hands at the small of your back. Inhale and arch backward. Imagine the front of your body lifting out and upward. Reach your hands to your heels, if possible. Allow your throat to open toward the ceiling. Go only as far as you can, making sure you always have the ability to breathe and swallow. Hold for five to 10 breaths. Bridge pose also targets your throat chakra, but by applying a little compression to the area. As you tuck your chin to protect your neck in the pose, you stimulate the chakra. Lie on your back with your knees bent and feet planted hip-distance apart. Lift your buttocks up off of the floor to create an arch from your knees to your shoulders. Draw your chin in slightly toward your chest to open the back of the neck. Walk your shoulders together underneath your back and clasp the hands or grab the ankles to accentuate the arch. Hold for several rounds of breath. Shoulder stand is an intermediate-to-advanced postures, so only perform it if you're well-practiced or under the guidance of a certified yoga instructor. If you have neck or shoulder problems, such as a herniated cervical disc, please skip it altogether. Shoulder stand, like Bridge, stimulates the throat chakra through compression. Lie on your back and lift your legs up toward the ceiling. Raise the backs of your hips off the mat and support your upper buttocks with your palms. Point your toes to the ceiling as you try to balance your feet, legs and shoulders in one line. Hold for 10 to 20 breaths. Plow is a natural progression from Shoulder Stand. If Shoulder Stand is not right for you due to your comfort level with yoga or physical boundaries, pass on this posture. Plow provides the most compression to your throat out of any of the throat-stimulating poses. When you're in it, you can't help but focus your energy there. From Shoulder Stand, keep your gaze at your belly and allow the legs to fall behind your head. Let the toes touch the floor, if possible; your legs should remain straight. Keep your hands supporting your lower back, but if your feet readily touch the floor and you feel in control, outstretch your arms onto the mat under your hips. Fish pose opens the throat chakra, as opposed to compressing it. This provides an energetic and physical balance. Lie on your back with your legs outstretched. Bend your elbows and keep your upper arms next to your ribs. Press down with your elbows to lift your chest, shoulders and head off the mat. Slowly arch your chest toward the ceiling and allow your head to fall back. If you've got the openness in your neck and spine, your head might touch the floor. Breathe here for five to 15 breaths.